This analysis seeks to update the UK Recession Watch (Feb 09) that forecast a recession which would see GDP peak to trough contraction of 6.3% and followed by economic recovery in the fourth quarter of 2009. In conjunction with the economic analysis, this article will also seek to forecast the date of the next general election as well as outcome of the vote in terms of MP seats per major party. The recession to date has seen GDP contraction of 4% which implies that the worst now ‘should’ be behind the economy, with average GDP contraction of less than 1% per quarter forecast for Q2 and Q3 thus should now start to be reflected in various economic indicators. UK RPI Inflation data of minus 1.2% for April 09 represents severe deflation in the official data. Whilst the Governments preferred CPI inflation measure has recorded a smaller decline to 2.3% which still stubbornly puts it above the Bank of England’s target rate of 2%. RPI deflation is not surprising given the panic interest rate cuts from 5% at the beginning of October 2008 to just 0.5% by the last cut of March 2009, these cuts in interest rates coupled with quantitative easing aka “money printing” to drive down long-term interest rates and hence mortgage rates is resulting in real deflation for those with large mortgages of as much as minus 5%, therefore this is providing for mini ‘temporary’ cash flow boom for those mortgage holders that have secure employment during the recession and therefore contributing to the summer bounce in house prices. UK Inflation Conclusion – Extreme Deflation as measured by RPI is near an imminent end, forward inflation will continue to remain subdued despite economic recovery into the 2010 and therefore supportive of low interest rates. Therefore the UK housing market is definitely seeing liquid buyers return to the market which ‘should’ be reflected in rising house prices during the summer months that undoubtedly will increasingly be taken by the mainstream press to conclude that the house prices have bottomed. Whilst the number of repossessions is forecast to hit a high of 75,000 this year, matching the the early 1990’s peak of 75,000, however this masks the impact of all of the government initiatives and bank arm twisting measures in an attempt to artificially keep people in their homes by a variety of means such as the “Mortgage Rescue Scheme” in the run up to the 2010 general election. This therefore means that reported repossessions data such as that from the Council of Mortgage Lenders (CML) will tend to under-report the true state of the impact of repossessions on the UK housing market as the reported repossession figures will mark but the tip of a much larger ice berg that could run to as much as a million home owners in arrears and helped to stay in their properties in one shape or another that will continue to impact negatively on the housing market price trend due to the supply of negative equity over hanging the market, that eagerly await a return to the housing boom to sell into. My Analysis of 21st February 09 ( UK Unemployment Time Bomb to Explode July 2009) warned that there exists the unemployment time bomb of the estimated 600,000 of school, college,leavers and graduates that are expected to join the labour market in July 2009 which could result in a surge of unemployment of as many as 250,000 in a single month, with also extra high unemployed numbers for subsequent months. This therefore implies that the ‘real’ economic recovery won’t kick into gear until we see unemployment start to improve which is not likely to occur until the end of 2009. On the basis of data released to date it does suggest that fourth quarter growth will still be weak, as the Labour government does appear to have timed for the positive economic news to occur in the time window of March to May 2010. However if the peak in unemployment should occur earlier than it would be a strong leading indicator for economic strength. Whilst it is beyond the scope of this article to forecast sterling’s trend, however the strong rally to above £/$1.60 is an leading indicator of economic recovery and thus higher interest rates. I will come back to an more in depth analysis of sterling in a future article, but I will say that in the immediate term sterling’s strong rally may have run a little ahead of itself and implies corrective action especially against an deeply oversold U.S. Dollar i.e. towards a target of £/$ 1.50 especially in light of the political crisis in the UK. The Labour government is reeling from the MP expenses scandal that looks set to see as many as half of its members of parliament disappear at the next General Election. A recent opinion poll in the Times puts Labour trailing behind the fringe Euro-skeptic UKIP party at just 16%, with the opposition Conservatives at 30% are failing to fully capitalise on Labours meltdown due to their own crooked MP’s, and the Lib Dem’s similarly skimming along at a low 12%. Whilst this and similar polls are dire for the Labour party which do suggest electoral wipeout in the June 4th European Elections, however they do not represent what is likely to occur at the May 2010 General Election which this article will seek to elaborate upon. In the course of updating the UK Recession Watch published last February that forecast peak to trough GDP contraction of 6.3%, and an economic recovery by the end of the this year, with subsequent analysis suggesting both a stealth stocks bull market and a bounce in the UK housing market, the most recent analysis to be published during June is increasingly suggestive of a clear strategy by the Labour Government of delivering a scorched earth economy to the new Conservative government whilst at the same time seeking to maximise the number of opposition MP’s that the Labour party will able to field post May 2010. During the fourth quarter of 2008, the Labour government’s goal was still to win the next general election and therefore the government response to the economic crisis was with a view towards leaving the country with an economy that was survivable in terms of electoral prospects at subsequent elections, which is why the government had at that time tried to both mask the amount of liabilities that the bankrupt banking system had forced onto the tax payers as well as tried to boost consumer spending without too much damage to the fiscal position of the countries finances by means of the £20 billion giveaway on VAT and other minor tax amendments. Alistair Darling’s forecast for government net borrowing for 2009 and 2010 in November 2008 totaled just £70 billion. However now the amount of borrowing has mushroomed to £350 billion, which is set against my November forecast of £405 billion for 2009 and 2010 alone, with continuing large budget deficits thereafter. Whilst some £500 – £600 billion of net borrowing over the next 3 years might sound alarming, however it literally marks the tip of the debt iceberg when it comes to Britians total liabilities that are set to grow from £1.75 billion at the end of 2007 to £3.9 trillion by the end of 2010 as a consequence of the £2 trillion of liabilities of the bankrupt banking sector being ceremoniously dumped onto the tax payers in addition to the deficit spending of £600 billion. The consequences of all this deficit spending and growth in liabilities is highly inflationary as printing money eventually leads to hyperinflation as 1920’s Weimar Germany found out, so Britain IS sowing the seeds of much higher inflation, maybe not this year and for the first half of 2010 as recent inflation analysis illustrated, but there will be a deficit spending and quantitative easing day of reckoning in terms of economic stagnation coupled with high inflation that will land on David Cameron’s lap. In conclusion, the Labour government’s primary objective now is to deliver David Cameron’s Conservative government a scorched earth economy whilst at the same time engineering a debt fueled economic bounce to maximise the number of seats the party will be able to muster in opposition, therefore current opinion polls and projections of seats at the next election grossly under-estimate the actual number of seats Labour will win. 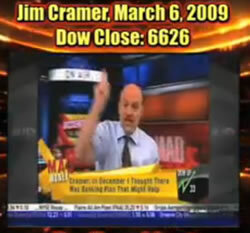 However, it is an apt time to remind the readership of the rating agencies such as S&P and others culpability in the fraud on investors where near worthless mortgage bonds were given and maintained a triple AAA credit rating all the way towards bankruptcy of the banking sector and near wipe out for investors who had been mislead by the credit agencies into thinking they were buying low risk bonds when they were buying extremely high risk. The reason for this were the fee’s earned by credit ratings agencies from the investment banks that created the mortgage debt packages that were to be sold onto investors, hence culpability of the credit agencies. Perhaps the credit agencies are seeking a higher fee from the British Government to sustain British Bonds at the triple AAA ratings? Secondly, we need to rethink our economic model, do we really want it to continue as an never ending expanding debt bubble economy that will periodically burst ? and more importantly seeks to enslave EVERYONE to the bankers and I MEAN EVERYONE ! That includes, individuals, corporations AND the GOVERNMENT. BEING IN DEBT EQUALS to BEING A DEBT SLAVE. You Work in part to PAY your Debt Slave Master, the Financial Institution that wrote your debt into existence at the tapping’s of a few keys. Thirdly Fractional Reserve limits must be enforced at 9 to 1. – NO Banks should ever be allowed to leverage to more than X10 capital. Fifthly – Accountable Bank Executives – The laws need to be greatly tightened where the culpable such as Fred Goodwin are actually made to account for their actions in a court of law, instead of being rewarded by ex-banker buddies in the government with multi-million pound cash lump sums on the tax payers backs. Seventh- INDIVIDUAL RESPONSBILITY – It is NOT ALL the bankers fault, many if not most individuals over a period of time turned themselves effectively into debt slaves, and now cry at the government to do something to alleviate themselves form their debt burden by the government punishing savers by cutting interest rates and devaluing the currency and also making it easier for debtors to default on their debts and wipe their personal slates clean via bankruptcy. The independent institution that overseas the regulation of the banking system needs to also have the duty of educating the population on the dangers of debt, and how to manage personal finances. This is even more important than competent regulation of the banks as once the population understands the value of money, debt and savings then they won’t be sucked into crazy 100% mortgages at X7 salaries that set themselves up for default and the banking institutions up for bankruptcy. The so called ‘socialist’ Labour party has shown its true colours in the expenses crisis, and attitude towards lumbering tax payers with the bankrupt banks liabilities i.e. enslaving ordinary citizens who will pay for the crimes of the bankers for at least the next decade and thereafter continue to have the debt noose around their necks in perpetuality. Is the country run for the benefit of few thousand bankers and the political aristocracy made up of a few hundred greedy MP’s that have cash funneled to in one shape or another, or for the other 60 million people ? Total GDP contraction to date now stands at -4% on a quarter on quarter basis, which is against my forecast for -6.3% total into Q3 2009, which strongly suggests that GDP contraction during the 2nd and 3rd quarters for 2009 ‘should’ moderate i.e. we are unlikely to see another figure as bad as 1st Q -1.9%, more probably the 2nd quarter GDP is likely to be at -1%. Whilst a strong bounce back in the economy is expected going into the 2010 election given the extreme measures adopted most notable illustrated by the £500+ billion budget deficit to generate just £67 billion of additional economic growth, however the post general election tax hikes and deep public spending cuts will in all likelihood trigger a double dip recession during 2011 to 2012 as illustrated by the below graph. Therefore my growing expectations are for GDP contraction that is marginally less than the forecast -6.3%, which also implies stronger growth during 2010, which will not be sustained during 2011 and beyond. British voters have been outraged by the MP expenses scandal as each day the Daily Telegraph publishes more evidence of outrageous claims that tax payers have paid for. However the root of the problem lies in the fact that MP’s fearful of voter backlash have under paid themselves relative to comparative professions such as NHS GP’s as the below graph illustrates. When Labour came to power in 1997 average MP pay was £43,722 against average NHS GP pay of £44,000, so both were inline with one another at that time. 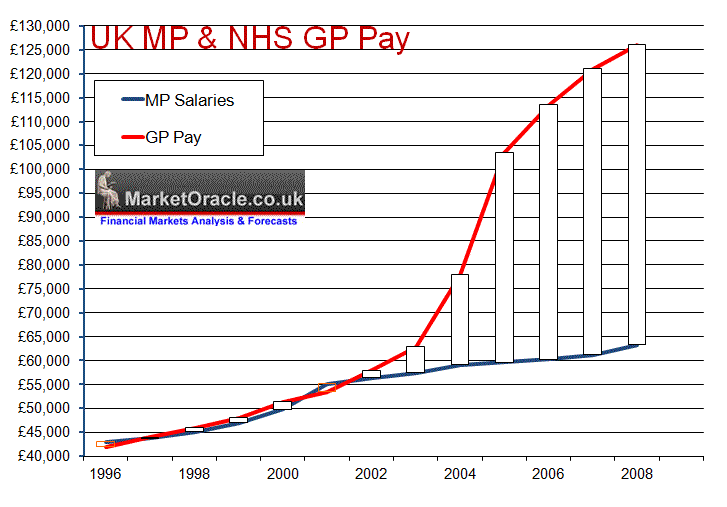 However as the above graph clearly illustrates that 2003 started to mark a serious divergence between GP and MP pay as GP Pay took off due to the new GP contracts that allowed GP’s to award themselves pay hikes of 30% per annum that has lifted average GP pay to £126,000 per annum against £64,000 for MP’s. The best solution to the current crisis would be if MP’s were paid NO second home allowances but instead their salary was raised to £98,000 per annum and similarly over paid GP’s pay was CUT to £98,000 per annum and thereafter BOTH groups pay is indexed. This will that MP’s no longer feel the urge to defraud the system due to a significant pay disparity against GP’s. This measure will also result a huge saving to the tax payers as 650 MP’s would cost the tax payer an extra £15.6 million a year, against 30,000 GP’s pay reduction to £98,000 saving the tax payers £840 million a year. Increasingly panicking Labour MP’s fearful of losing their seats at the next election are now in open rebellion against the Prime Minister, with a secret email that appeared a few hours ago seeking to add MP’s to a list aimed at removing Gordon Brown from Number 10. The strategy is for the rebellion to reach critical mass of 60 or 70 Labour MP’s which would be enough to force Gordon Brown’s hand bring about a Leadership challenge. However, the above analysis clearly illustrates that the UK economy is showing signs of having put the worst behind it and that Britain is on track for a strong economic bounce going into the Summer 2010 election deadline primarily due to the Labour government borrowing to spend a net deficit of more than £500 billion to generate growth of just £67 billion which in effect delivers David Cameron’s Conservative government a scorched earth economy whilst at the same time engineering a debt fueled economic bounce to maximise the number of seats the party will be able to muster in opposition, therefore current opinion polls and projections of seats at the next election grossly under-estimate the actual number of seats Labour will win. The general election forecast is for 225 seats for Labour and 343 seats for the Conservatives which implies a Tory government with a much smaller majority of 36 than the 192 being bandied about in the mainstream press this week, which would mean that the next Conservative government will not be able to implement many of the more radical reforms necessary to restructure the economy in terms of deep cuts in public spending and therefore suggests a weaker government that could by mid-term at the the mercy of rebel euro-skeptic MP’s much as John Majors government of 1992 to 1997 experienced. This is potentially bad news for the economy as it confirms my expectations of continued stagnation for most of the term of the next government i.e. low average growth coupled with above average inflation as a consequence of not being able to mend countries finances which is likely to continue to see large year on year budget deficits and therefore achieves the Labour parties strategy of delivering a scorched earth economy to a Conservatives one term crippled government, that sows the seeds for a landslide Labour victory come the 2014-2015 election. Meanwhile the Lib Dems are expected to see their strong gains of 2005 all but disappear due to the fact that many of the Lib Dem marginal seats are against the Conservatives rather than Labour, and given the strong swing to the Tories the Lib Dem’s blood bath could even be worse than that for Labour with potentially as many as half of Lib Dem seats being lost. As things look today, Gordon Brown appears to have well and truly blown his chances of getting re-elected at the next Election in 2010. – Nadeem Walayat – October 2007. However, I need to remind readers that we are in a stocks stealth bull market that has already delivered a powerful 35% gain to date, so whilst a stock market correction is expected into the end of June, it is still just a correction against the trend, that has been missed by virtually ALL analysts that either continue to re-write the rules in support of this still being a stocks bear market rally, clutching at straws such as contracting corporate earnings (old news) or attempt to re-write history so as to imply that they saw this rally in their rear view mirror as I warned of at the beginning of April and which during this week was most evident in CNBC’s “Mad Money Man” Jim Cramer attempting to re-write history to imply that he called the market bottom at Dow 6,500 as the video hosted by youtube illustrates.